New images have been unveiled of the proposed Olympicopolis, a new cultural district at London's Queen Elizabeth Olympic Park designed by architects Allies and Morrison and O'Donnell + Tuomey. 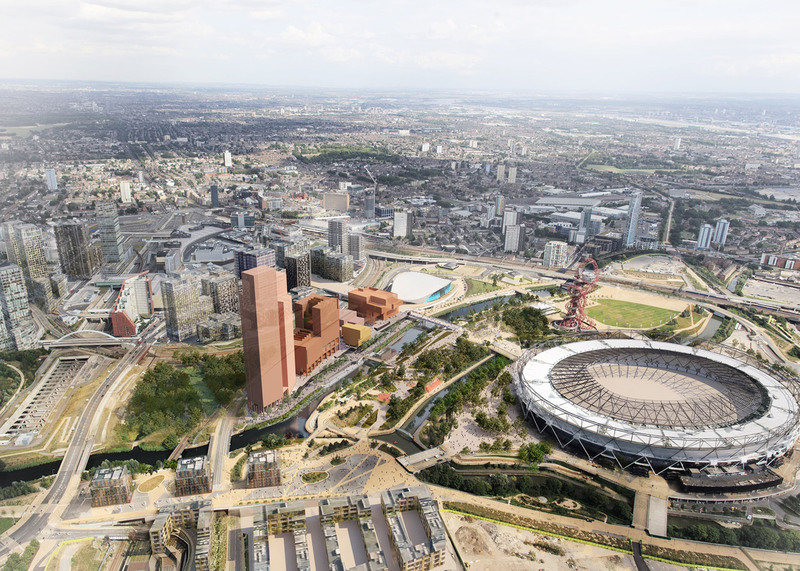 London-based Allies and Morrison and Irish firm O'Donnell + Tuomey won a bid to develop the former 2012 London Olympics park last May. They are working with Spanish studio Arquitecturia, landscape architects Gustafson Porter, engineer Buro Happold and construction firm Gardiner and Theobald on the 70,000-square-metre east-London site, named Stratford Waterfront. Renderings of the scheme reveal the designs for outposts of the V&A and Smithsonian museums, a 600-seat theatre for Sadler's Wells and a campus for the London College of Fashion. Featuring set-backs and protruding balconies, the new cultural buildings will be stationed alongside the stretch of water extending out from Zaha Hadid's Olympic Aquatics Centre. The project also includes a 75,000-square-metre residential development. The Olympicopolis project was first unveiled by London mayor Boris Johnson at the end of 2013 to form a new gateway to the Queen Elizabeth Olympic Park. A planning application for the development is expected to be submitted for the scheme in December, with building work expected to commence in 2018. The entire Stratford Waterfront complex is expected to open by 2021. The development is anticipated to create 3,000 jobs, attract 1.5 million visitors a year and generate a £2.8 billion boost for the local economy. Many of the buildings designed for the London 2012 Olympic and Paralympic Games have already been converted into public venues. London firm Stanton Williams has transformed the Olympic training facility into a venue for the UK's hockey and tennis organisations, while the aquatics centre designed by Zaha Hadid Architects has been reduced in scale. Other proposals for the park include wrapping a giant slide around the Anish Kapoor-designed ArcelorMittal Orbit sculpture and the creation of a new design school for University College London.